Roses are perfect for showing somebody special how much you love them. An elegant display of stunning spray roses of a variety of colours. These beautiful Rosaceae roses and brought in fresh from Kenya in the backdrop of Mount Kilamanharo. These roses are delivered in tight form so the roses longevity is increased so you or your recipient can enjoy the roses for longer. All the more reason to choose this stunning bouquet of 12 Kenyan Spray stems displaying an average of 50 rose heads of beautiful mixed colours. 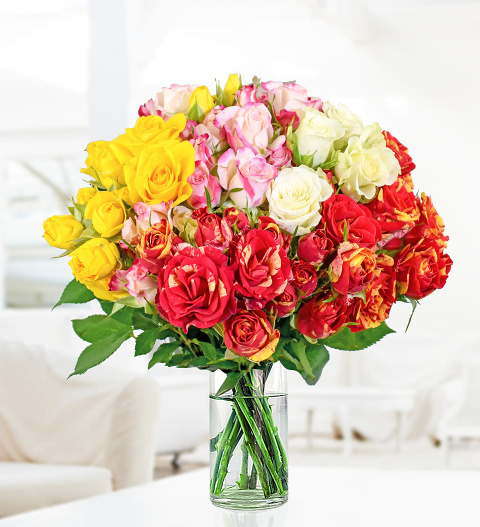 With a variety of colours, this delightful bouquet is simply perfect for celebrating any occasion. Available for UK next day with a FREE box of handmade British Chocolates. Chocolates may contain nuts.